Thank you for participating in this special release promotion. This lighthearted session will help you keep your sanity while dealing with difficult people and challenging situations. Laugh and learn as you boost your attitude with 7 Sparkle-Tude™ Boosters! Fast-paced and highly-energetic, discover tips and phrases you can use right away in your personal and professional life! This program was presented following Olivia Newton-John, at the Sharp Womens’ Healthcare Symposium. Sheryl Roush is a 12-time published author and an internationally recognized for high-content “how-to” keynotes and seminars on boosting attitude, communication skills, and creating positive work environments. MP3 file. All rights reserved. Copyright protected material. Sheryl Roush is available to present at conferences and events. 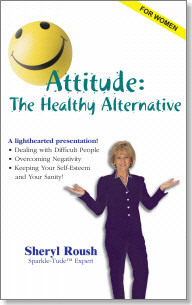 Visit www.SparklePresentations.com for topics, titles and availability, or call Toll Free 1-800-932-0973 to schedule Sheryl Roush to speak! See www.HeartBookSeries.com for inspirational gift and business books for women, including Heart of a Woman in Business, Heart of a Woman, Heart of a Mother, and Heart of the Holidays. This entry was posted on Sunday, March 8th, 2009 at 6:47 pm	and is filed under DOWNLOADS, Speaking Events. You can follow any responses to this entry through the RSS 2.0 feed. Both comments and pings are currently closed.